The target: Beat the Heat! Due to the linear temperature coefficient of copper wire, its resistance is dependent on temperature which increases linearly with the application of heat. This means that the higher the temperature of the copper wire, the higher the internal resistance will be. In terms of motors this means that as the motor gets progressively hotter during operation, the copper coils internal resistance (Io) also increases proportionally. 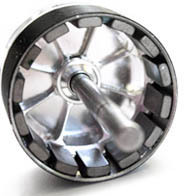 This in turn degrades performance and consistency in flight as the motor gets hotter and hotter. So how do you beat the heat? Some of the common brushless outrunner manufacturers have gone as far as incorporating high temperature magnets and exotic adhesives to circumvent the effects of the heat problem. There are myriad of crude and inefficient cooling techniques ranging from a multitude of holes, to fins, to bolt-on fans and impellers. Unlike those, the new PA Thrust® cooling design took a complete departure in the current thinking by engineering a High Velocity Force Cool Ventilation (HVFCV) into the rotor end bell as well as taking full advantage of thermodynamic properties of the stock material itself. HVFCV is achieved through a set of solid metal turbine impeller blades painstakingly CNC milled as an integral part of the rotor end bell assembly, which not only provides the positive force cool ventilation by drawing fresh cool air through the stator and magnets, but also doubles up as a heat pump to first draw excess heat from the rotor assembly itself and then act as a heat exchanger by expelling it through the air stream contacting the solid metal turbine blades as it spins at high velocity. Micro ridges, intentionally CNC cut into the rotor, further multiples the end bell’s surface area and serve as radiators to further boost thermal dissipation achieving unparallel cooling and henceforth having the ability to swing larger propellers than other conventional outrunner motors of similar class while remaining considerably cooler and more efficient.. There is more to the “Cool” look of the CNC exterior casing than meets the eye, and looks can be deceiving. Under the hood, is where serious engineering comes into play. With only the highest quality materials and components used in the manufacture, the new PA Thrust® motors are manufactured with the tightest tolerance making it possible to maintain the smallest air gap between the stator and shaped neodymium magnets, significantly boosting torque and thrust. The relatively silent and vibration-free operation of the motor is a testament to the tight tolerance manufacturing regime we have adopted specifically to harness the maximum power produced by the motor (within the limits of today’s technology) for the sole purpose of swinging the prop. This allows the motor to swing propellers of at least one size larger than any contemporary motors in its class while running cool with maximum efficiency. Temperature management is extremely important. Keep in mind that motors of similar specifications, but of different designs, will appear to produce similar results on the bench. But in the air, their performance is totally different and a cooler running motor will perform considerably better due to the lower coil internal resistance and other factors.